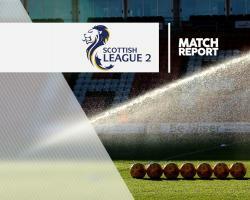 Forfar extended their lead at the top of Ladbrokes Scottish League Two to 11 points after a 1-0 win against second-placed Arbroath at Gayfield Park. Josh Peters got the only goal of the match on 33 minutes when he latched on to Gavin Swankie's through ball to smash home and earn Forfar's first league win over the Smokies in three attempts this season. The results means that the Loons are now unbeaten in their last nine league matches as they head towards promotion to League One. Berwick eased past Annan to move further away from basement club Cowdenbeath following a comprehensive 4-1 victory at Shielfield Park. Steve Thomson scored a brace in six first-half minutes to put the hosts in control before Peter Weatherson reduced the arrears before the half-time interval. Jordan Orru restored the two-goal cushion with a left-footed strike with three minutes remaining and Thomson completed his hat-trick in stoppage-time. Montrose made it three wins on the bounce following their 2-1 comeback at Stirling. Blair Henderson put the Binos in front from the penalty spot after Kieran McWalter brought down Willie Robertson in the area, a lead they took into the break. There was still time for Stirling midfielder Calvin Colquhoun to receive his marching orders for two bookable offences. Edinburgh City and Clyde played out a goalless draw at Meadowbank Stadium which extended the visitors' winless league run to nine games. The match between Cowdenbeath and Elgin City was postponed due to a waterlogged pitch at Central Park.